1. Have a well SEO’d website. Sometimes SEO doesn’t matter, but those cases are rare. For most businesses with a website, search will be the number one traffic source. If you haven’t spent much time thinking about SEO, read about How To Get Started With SEO. You’ll have to decide if you want to hire a consultant or do it yourself. That article will help. If you decide to hire an SEO consultant, please ignore sales pitches for cheap SEO and learn the costs, expectations and realities of small business SEO. 2. Have a great and active blog. Online success demands a content strategy. For most, a blog is the perfect way to execute a content strategy. (Quality articles posted regularly on your website might be an acceptable substitute.) Blogs are a great way to train the crawlers to visit your site consistently. A great blog will bring you more search engine traffic because they help you get more links and indexed pages. Don’t worry about how long your blog posts should be. Write stuff that your target audience will find interesting. If you need blog content ideas, try things like Delicious.com or question-based keyword research tools. 3. Be active and interesting on appropriate social networking sites. Social media should not be your primary online asset; it should promote your primary business asset, i.e. – your website and blog. Don’t spam or try shortcuts; you can’t buy your way to thousands of committed fans/followers. More importantly, don’t focus on how many fans or followers you have. It’s better to have a small group of loyal fans than a huge following of people who don’t care about you. 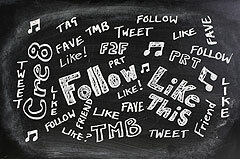 Understand why we like and follow businesses on social networking sites, as well as why we stop liking and following. If you’re still unsure about social media, watch a video that shows what social media is all about. 4. Have great products or services. Great search marketing won’t hide the fact that you have a lousy product or service. That’s true. You may sell a few people on your average/lousy products or services, but it won’t last long. There’s nothing more important than having your customers’ trust, and providing great products and services is a great way to earn trust. Let me clarify what I’m talking about: Online success takes planning, commitment, hard work and patience. It’s not easy — far from it. But it is simple. If you cover those four things above, the sky is the limit for your business. I’d say point 2 is where most of the sites fail. After all, this is the part where your readers will not whether it comes from a passionate writer or was outsourced to someone else. Great read. I am currently building a new site and am curious about #2. Should I have a tab resident on my website that directs to my blog (not currently writing one but have interest in doing so), or should the blog itself be an entirely separate entity that’s hosted elsewhere? Thanks!! I think only building traffic is the work. Anyways thanks for posting this post.